(a) Install the thrust stopper and sliding yoke to the steering column assembly. (b) Install and temporarily tighten the bolt A. (a) Install the steering column assembly with the 4 nuts. (b) Tighten the hose clamp. Install the hole cover with the 4 bolts. (a) Align the matchmarks on the No. 2 intermediate shaft and control valve shaft. (b) Install the bolt C.
(c) Install the bolt B. (d) Torque the bolt A. Install the LH lower panel with the 4 bolts. (a) Install the lower No. 1 panel with the screw. (b) Connect the hood lock release lever and fuel lid release lever with the 4 screws. Install the cluster finish panel and connector. Install the cowl trim with the clip. (a) Install the combination switch with the 3 screws. 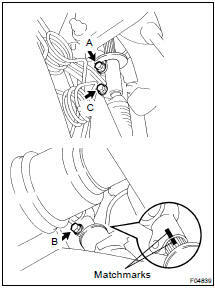 (b) Connect the airbag connector. (c) Tilt steering column: Connect the 3 connectors. (d) w/ Power tilt and power telescopic steering column: Connect the 5 connectors. Install the upper and lower column covers with the 3 screws. (b) Turn the cable counterclockwise by hand until it becomes harder to turn the cable. (c) Then rotate the cable clockwise about 2.5 turns to align the mark. HINT: The cable will rotate about 2.5 turns to either left or right of the center. (a) Align the matchmarks on the steering wheel and main shaft. (b) Install the steering wheel set nut. Never use airbag parts from another vehicle. When replacing parts, replace with new ones. Make sure the wheel pad is installed to the specified torque. If the wheel pad has been dropped, or there are cracks, dents or other defects in the case or connector, replace the wheel pad with a new one. When installing the wheel pad, take care that the wirings do not interfere with other parts and are not pinched between other parts. (c) Install the pad after confirming that the circumference groove of the torx screw is caught on the screws case. (d) Using a torx socket wrench, torque the 2 screws. (e) Install the steering wheel lower No. 2 and No. 3 covers.